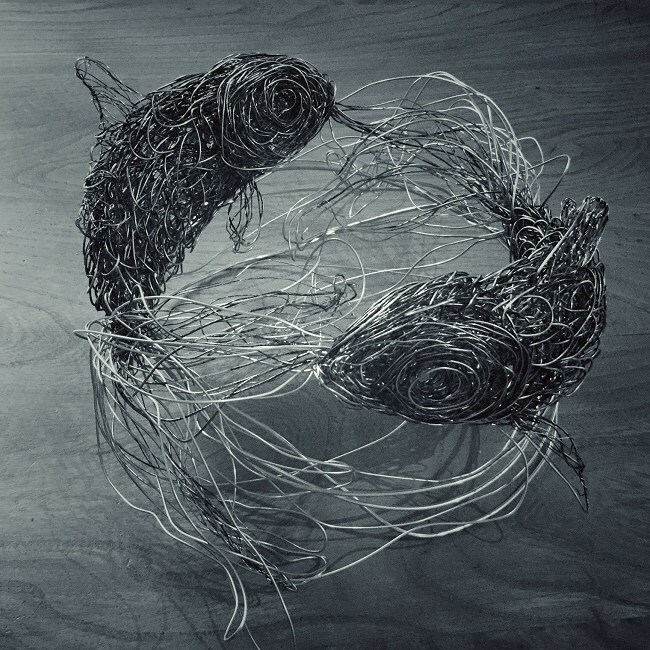 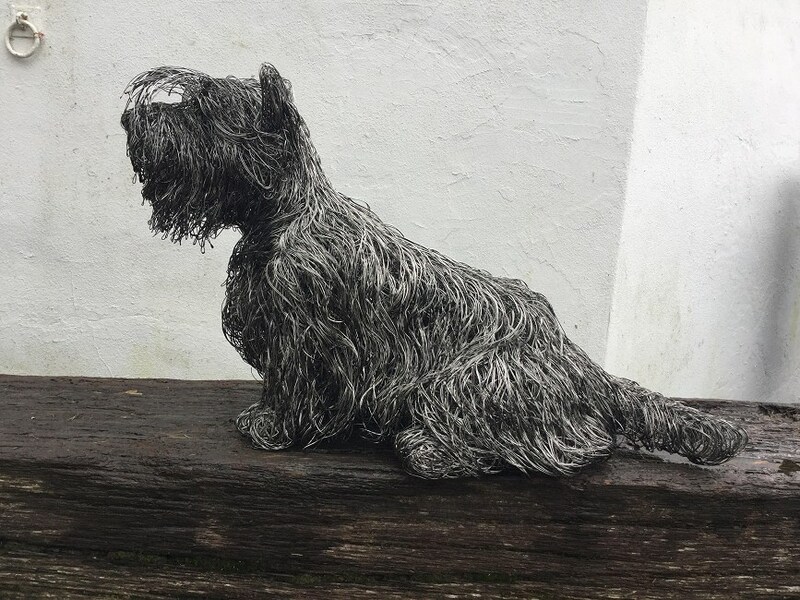 Candice Bees is an award-winning artist and creator of three-dimensional wire sculptures, based in the UK. 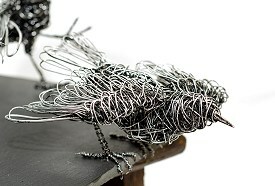 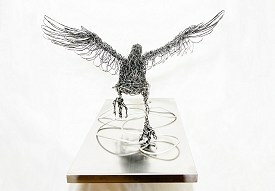 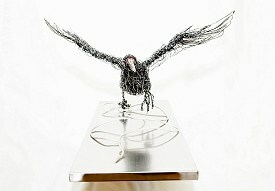 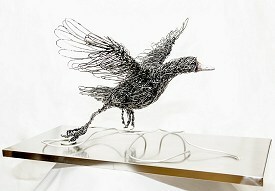 Below you will find a selection of Candice's wire sculptures. 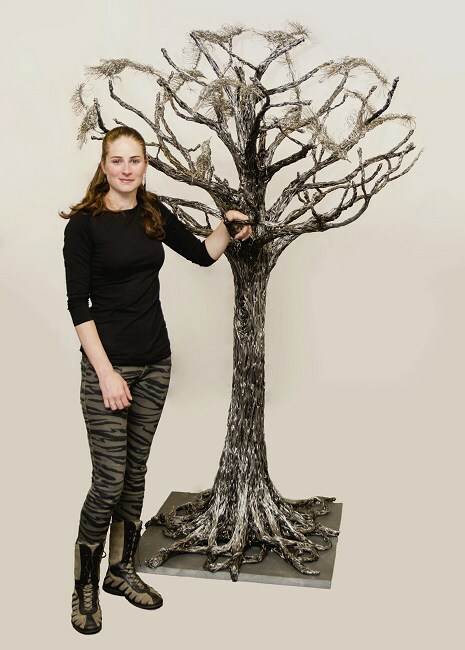 You can also view pages featuring Candice's smaller loose sculptures, her smaller detailed pieces and life sized pieces. Several of Candice's sculptures are available to purchase. 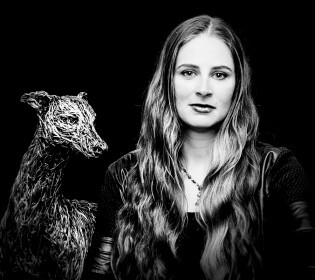 Candice is also available for commissioned work. 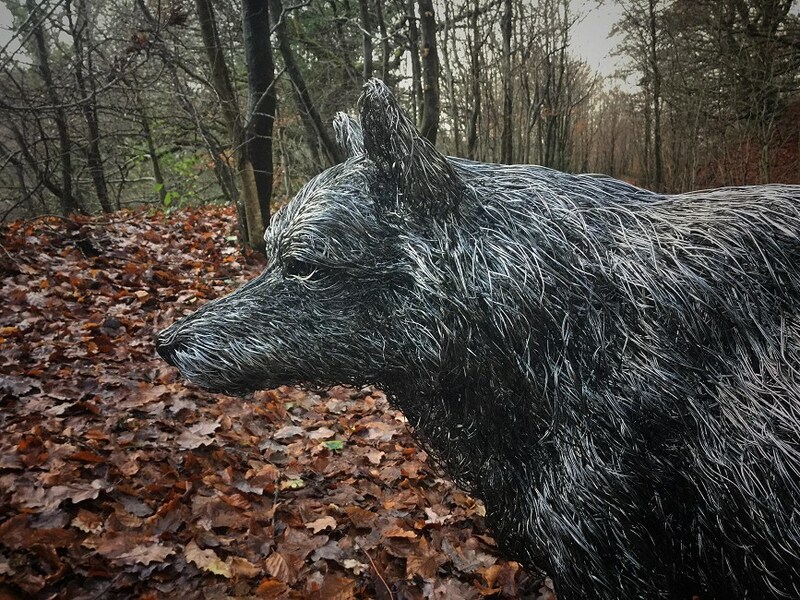 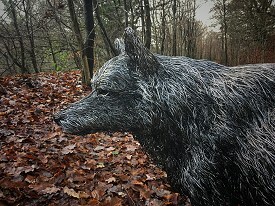 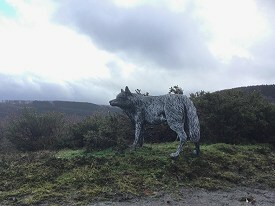 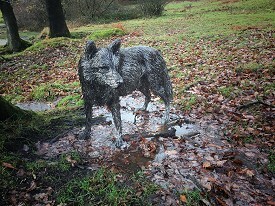 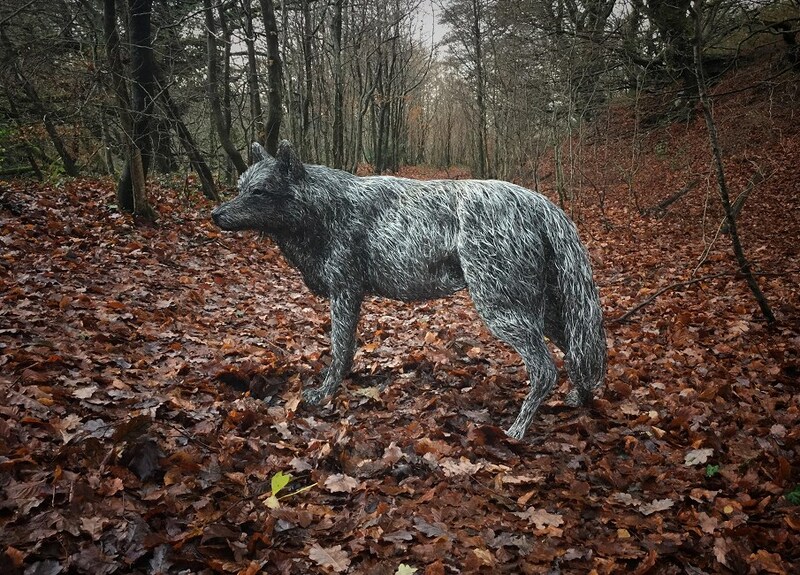 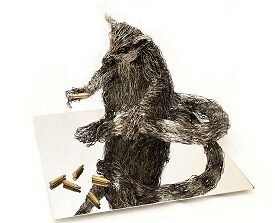 The third life sized Wolf, made from stainless steel wire. 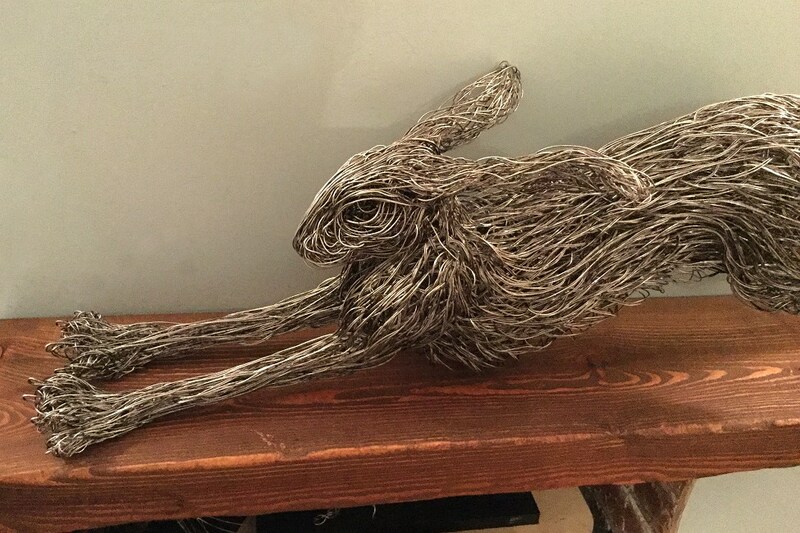 A life sized stretching Hare made using stainless steel wire. 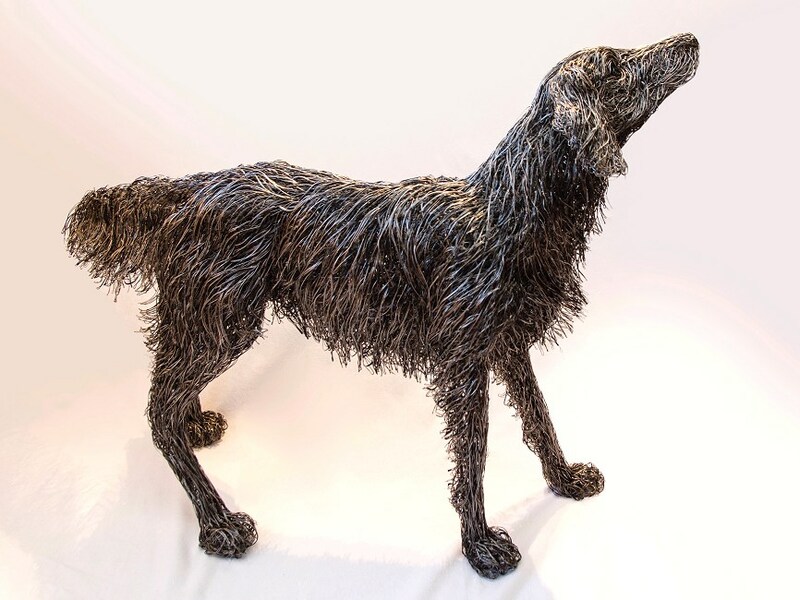 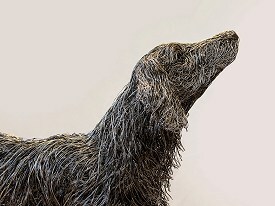 A life sized Flat Coated Retriever called Murphy, made with stainless steel wire. 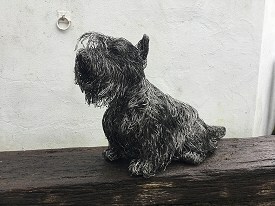 This sculpture was a portrait commission. 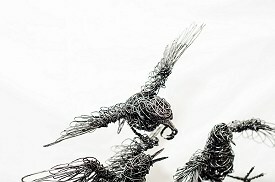 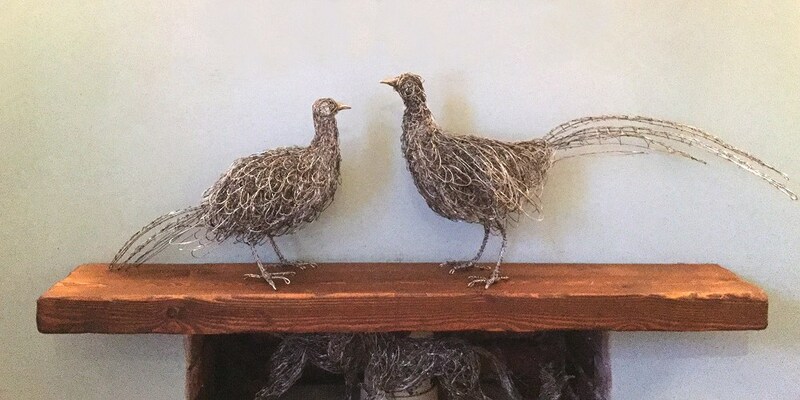 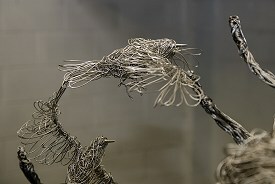 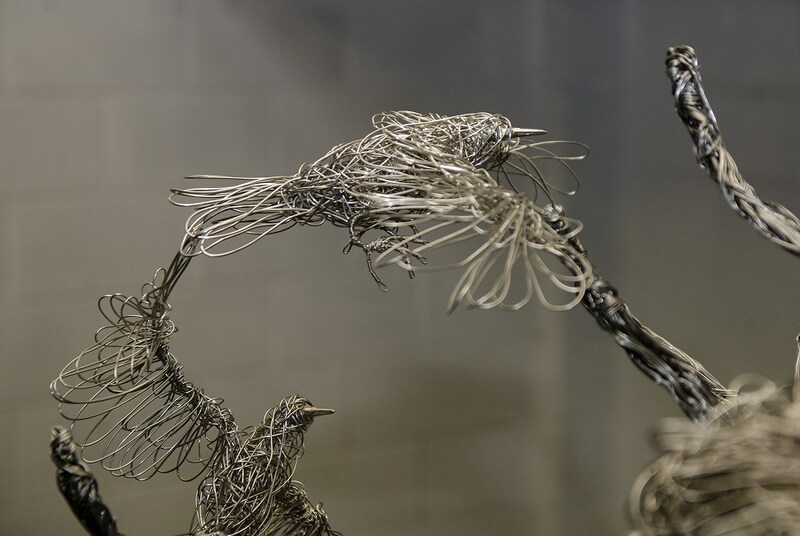 A pair of Pheasants made from stainless steel wire. 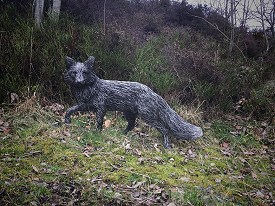 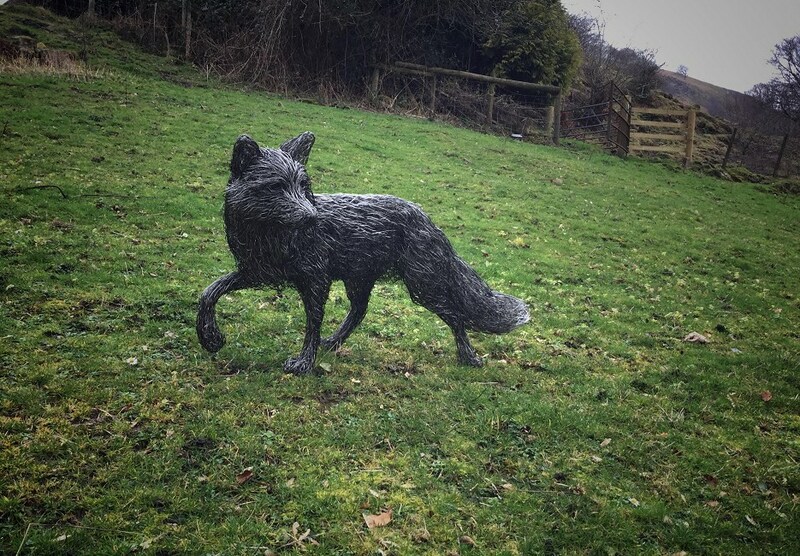 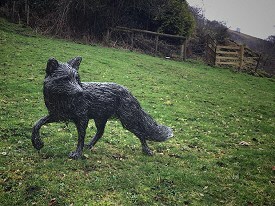 A life sized Fox made with stainless steel wire. 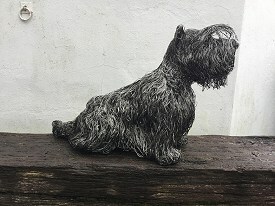 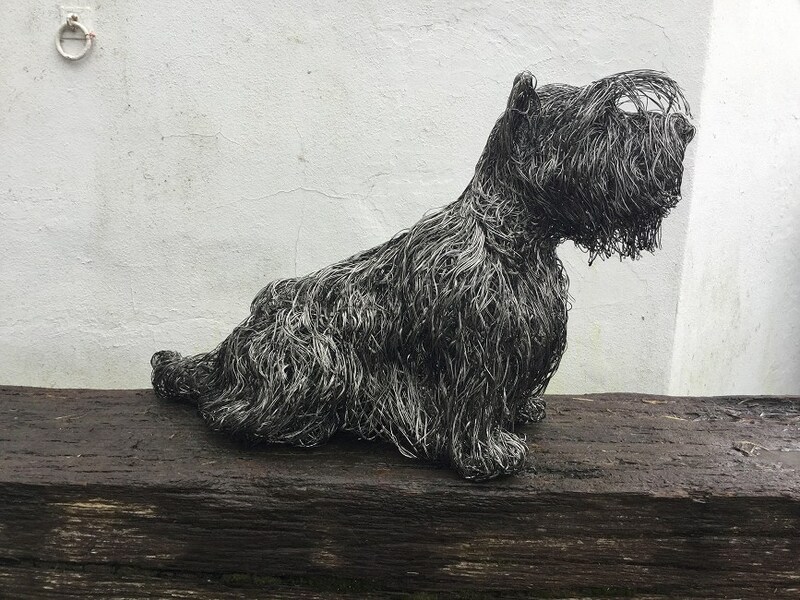 Life sized Scottish Terrier made from stainless steel wire. 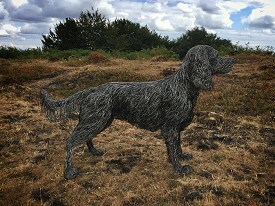 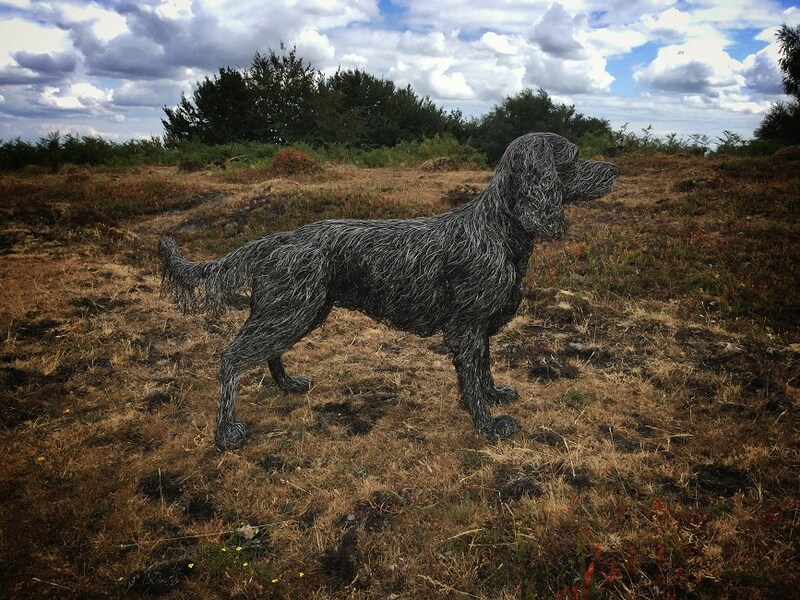 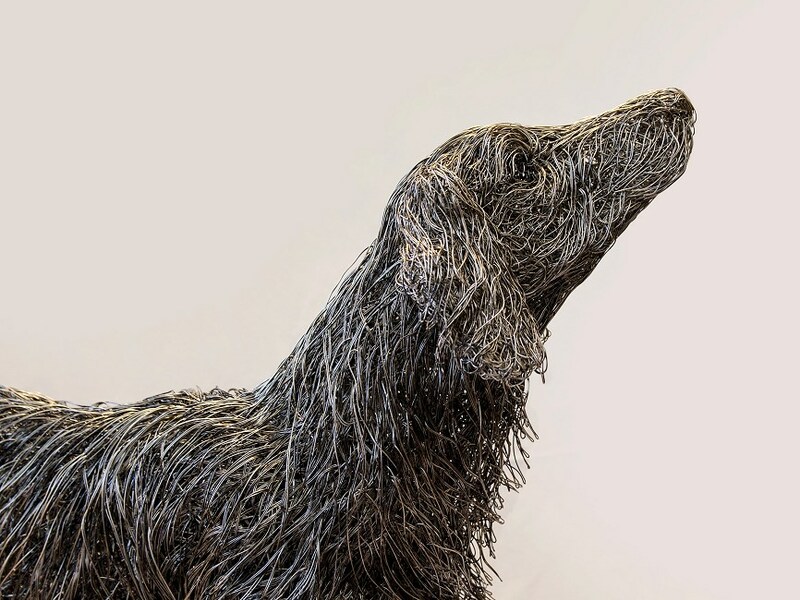 A slightly larger than life sized working Cocker Spaniel, made using stainless steel wire. 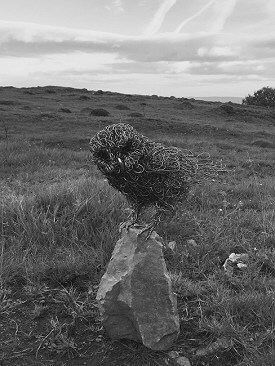 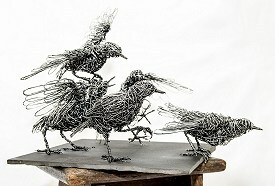 Life sized Starlings made from galvanised steel, mounted on a slate base. 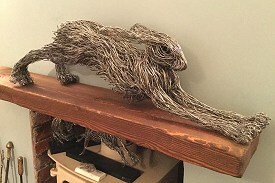 This piece was exhibited in the Mall Galleries in London, between 29th October and 8th November 2015, as part of the Society of Wildlife Artists Annual Exhibition. 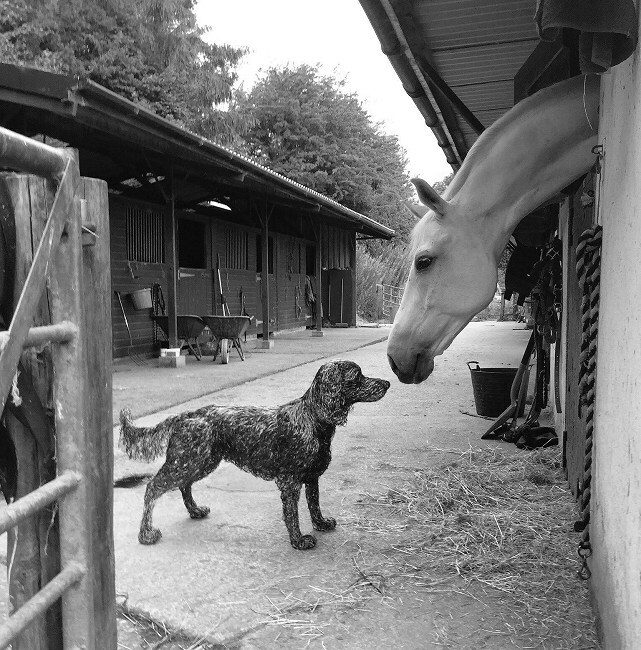 Photography by Louise Grahame. 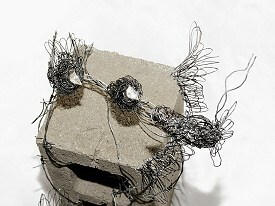 This sculpture was sold at the exhibition. This piece was made from stainless steel wire, and is mounted on a reflective stainless steel base. 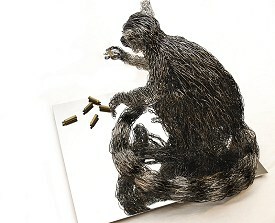 The bullet casings are real. Reality Check was selected for display at the 2017 Bath Open Art Show at 44AD Art Gallery in Bath, where it won the won the People's Choice Award. 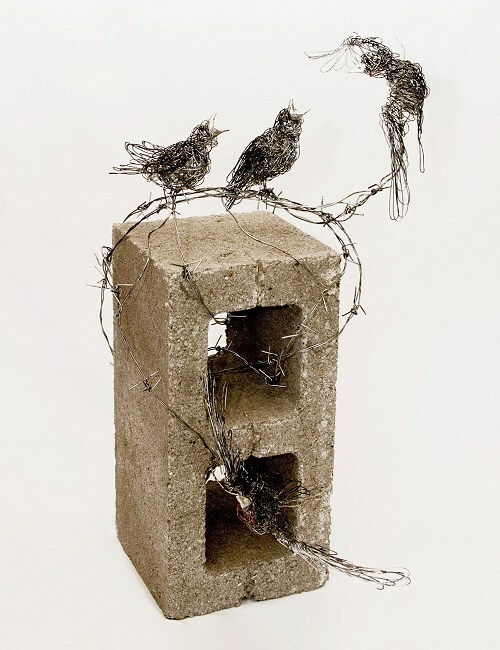 This piece was made from a concrete block with barbed wire and stainless steel wire. 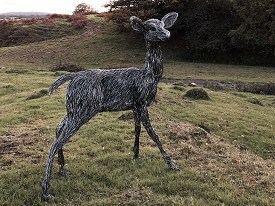 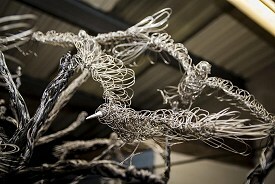 A life sized Fallow Deer made from stainless steel wire. 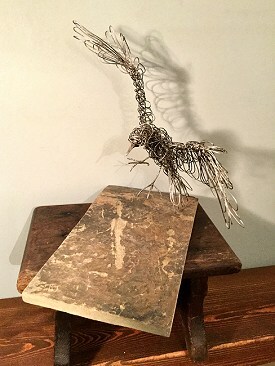 This piece is for sale. 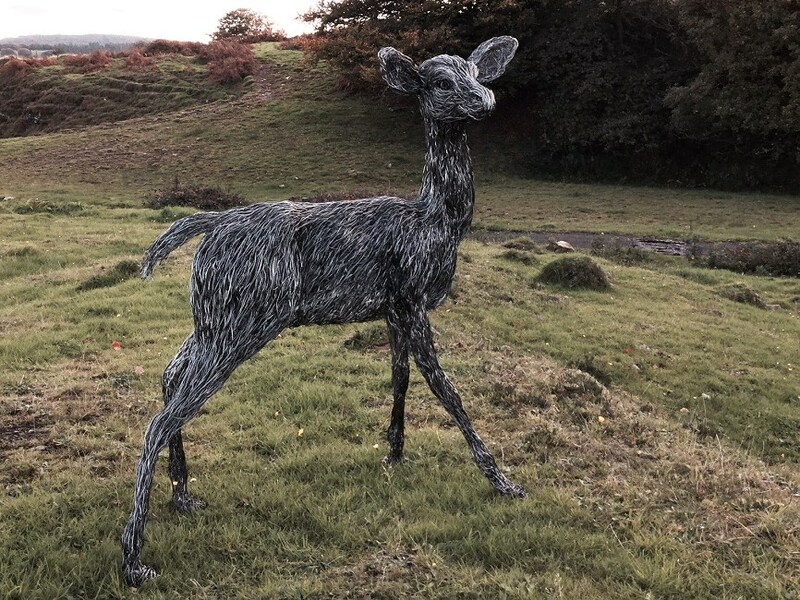 Life sized Fallow Deer made from stainless steel wire. A collection of exhibition pieces created by award-winning artist Candice Bees. 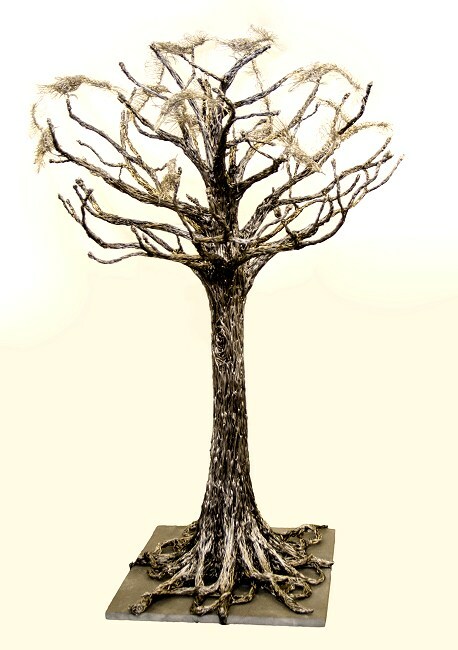 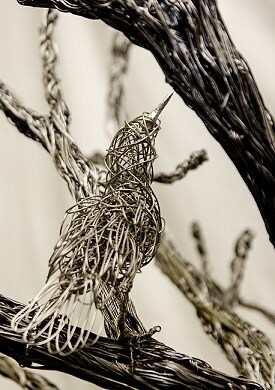 Aluminium wire tree with stainless steel wire Starlings on a slate base. 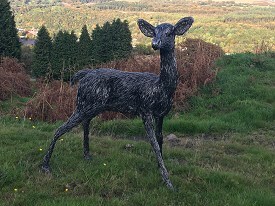 This sculpture is a private commission. 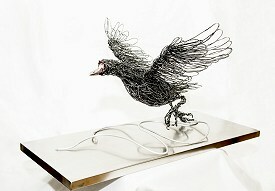 Galvanised steel wire and aluminium set on stainless steel base. 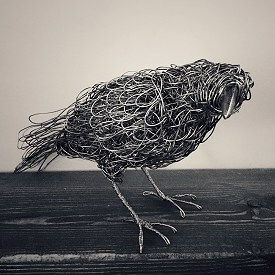 Photography by Louise Grahame. 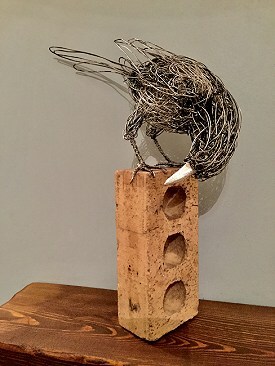 This piece has now been sold. 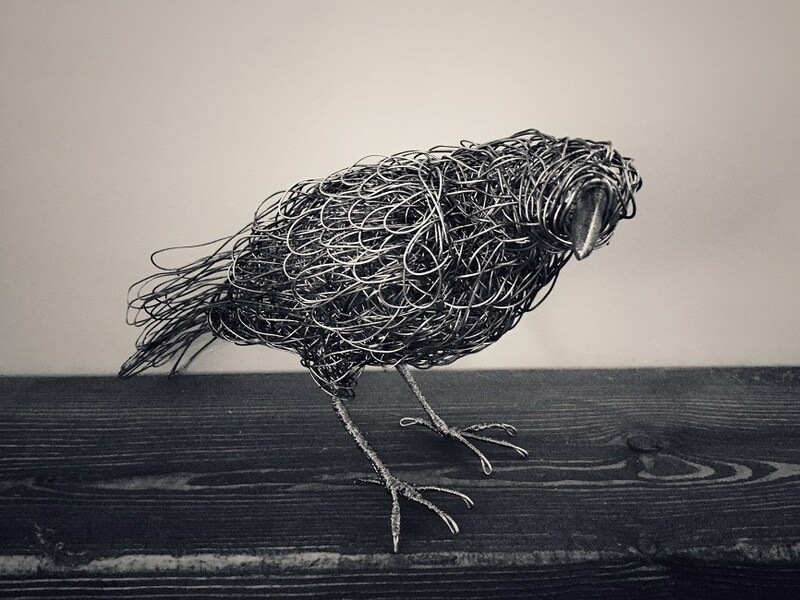 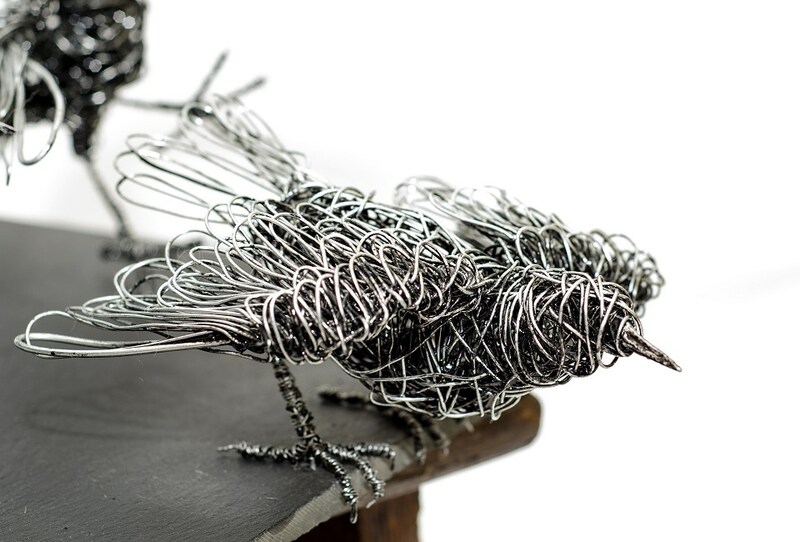 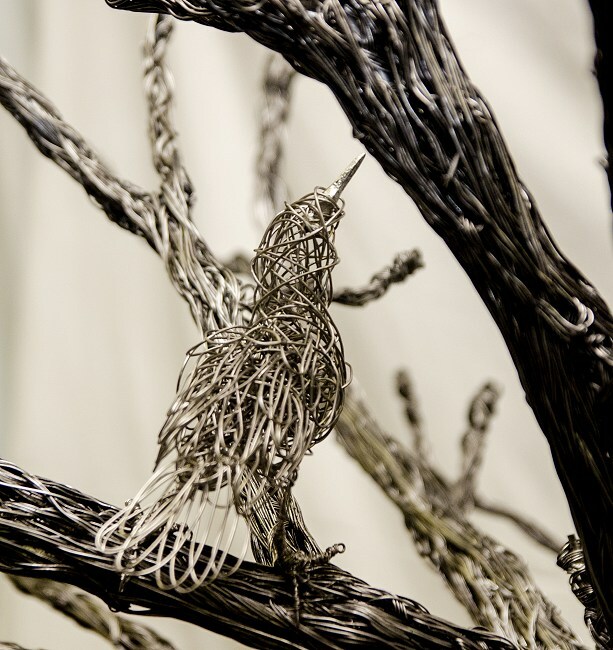 Candice is an exciting emerging award-winning artist who originally trained in illustration, but has now taken up sculpture to portray animals of all shapes and sizes, using wire as a medium. 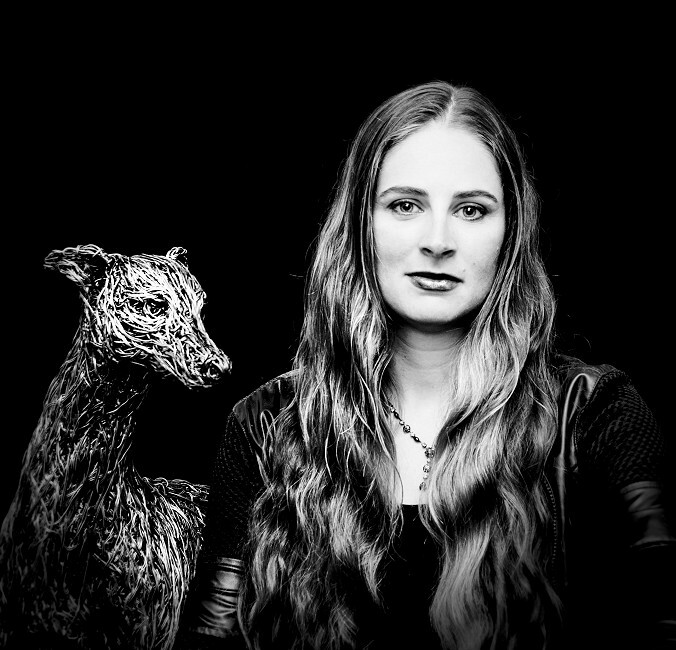 Candice grew up in South West England surrounded by many different species of animals. 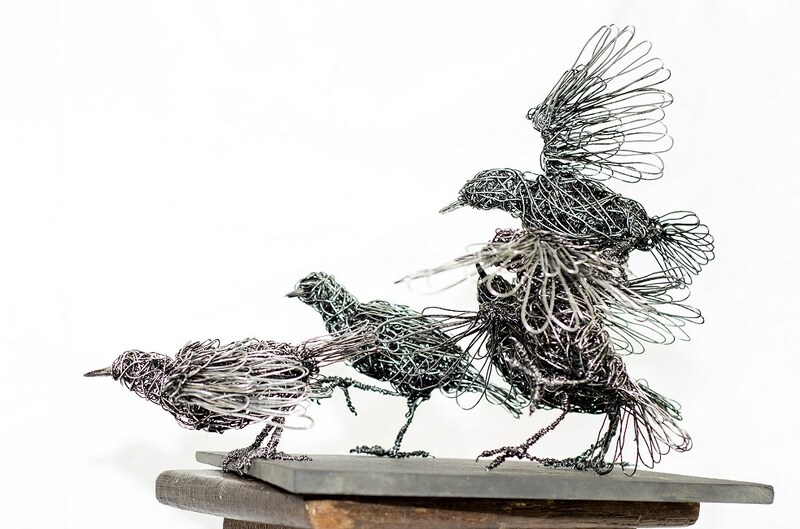 Her love of animals accompanied by a sound understanding of anatomy and movement has resulted in Candice using her artistic skills to express animal's motions and interactions that we may overlook in our daily lives. 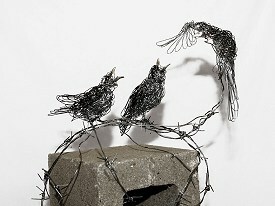 Candice believes that it is the subtle behaviour that is the key to giving life to her artwork. 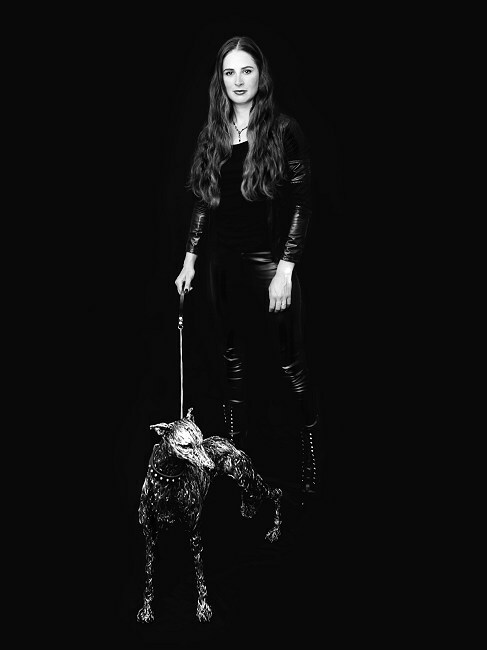 She has spent countless hours studying animals and their behaviour to better understand how to accurately portray the action that she is looking for. 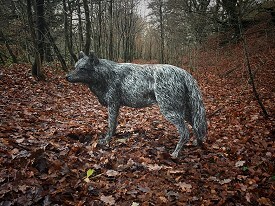 Candice has exhibited locally and in London, including twice at the Society Of Equestrian Artist's annual show at the Mall Galleries, at the Society of Wildlife artists annual exhibition, and at the David Shepherd Wildlife Artist of the Year exhibition, where Candice won the Urban Wildlife category for her work Unnatural Selection. 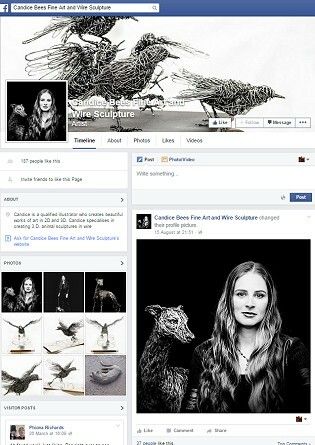 Stay up to date with the very latest developments by following the Candice Bees Facebook page. 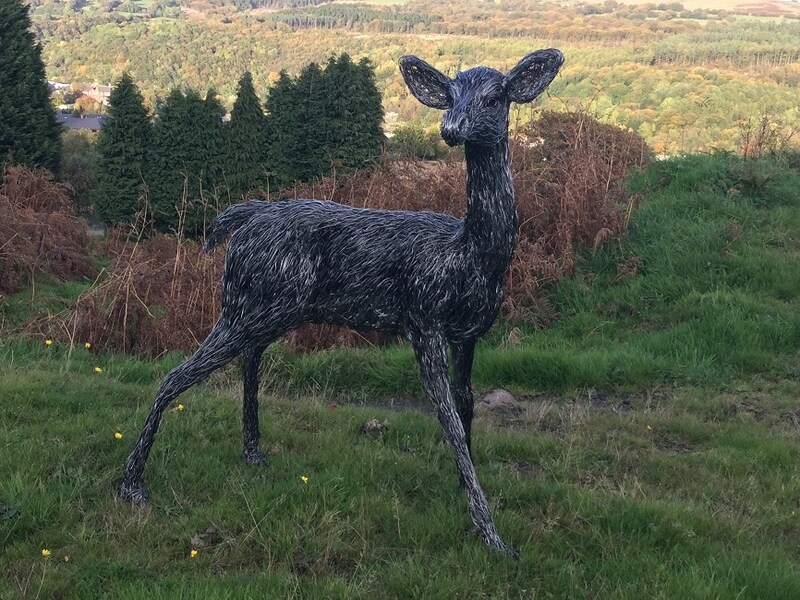 Please feel welcome to contact Candice via email or telephone 0779 9734050 with your enquiry. 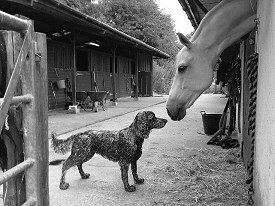 Thank you for visiting www.candicebees.co.uk.